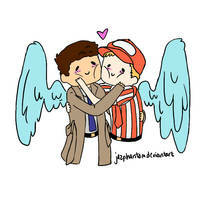 In which Castiel admits he is a unicorn to his lover, Dean. I finished the first season in less than a week. I'm on episode 12 of season 2. 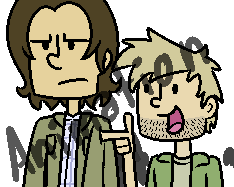 I haven't actually met Cas in the show yet, but I practically know EVERYTHING about him. I watched all the seasons leading up to the *current* last one all over my winter break. All i did was watch SPN and i caught the flu and yeah. love that show. Sammy's goin' cray cray ;n; I was like "NUU SAMI WAT R U DUIN!!!" He really doesn't start acting adorable and fluffy and gay until later on. When he first shows up he's kinda all "BOW BEFORE ME I SERVE THE LAWRD" and then later on "BOW BEFORE ME I AM YOR LAWRD"
then the last couple seasons he's all cute and you're kinda dying from all the destiel. A lot of people have told me to watch it because I watch Sherlock, and Doctor Who, and all that stuff, and I'm pretty sure that most people who like those shows would like SPN, right? Finished the first season in a week and the second in a little over 1.
hah, there's a reason why it's SUPERWHOLOCK. or superwhomeravengelock....... throw in hannibal.... somewhere. but you came out stronger... you are a survivor! My gosh. I'm watching some Star Trek at my friend's house and asdfghjkl I'm just really happy. I wanna watch some Star Trek! Is it thinner or something? Like angel hair pasta? Or is it just holy? The center is thinner so the kernel things are longer! I do too, but I like thicker noodles. I just don't get those a lot compared to angel hair so I like the texture. Is that weird? And I SQUEE endlessly at yet another amazing comment from you. Bravo, sir. I say BRAVO. Sorry for the awkwardness I caused then XD And you actually haven't commented on me before, I've just seen your comments on a few deviations. I've commented on TONS of deviations. Omigosh. You must look at Misha's twitter. His last two tweets are priceless. I seriously can't stop laughing.